Welcome to Day #4 of Chocolate and Cherries Theme Week. The back side of today's 66 percent bar with organic blackberries, blueberries and cherries from Ethereal Confections (Woodstock, IL) was a great fiesta of berry and cherry bits. 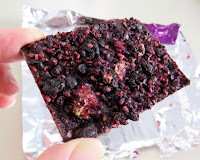 Despite the fruit-forward appearance and flavor, I could also taste glimmers of the underlying chocolate. Pleasant, with an occasional smoky and sweet note. 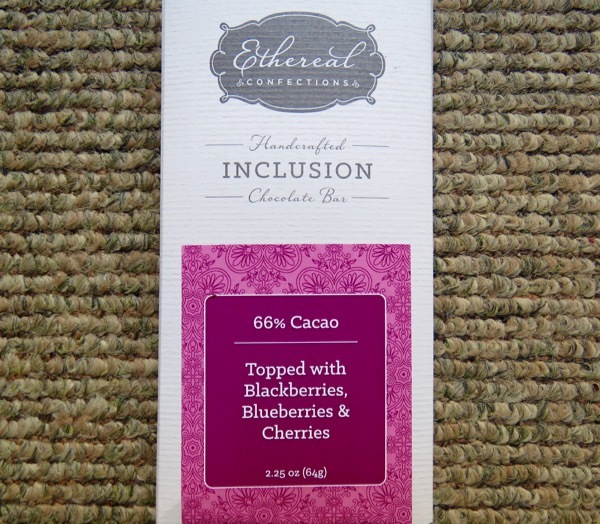 Thank you to Mary and Sara Ervin, the owners and co-founders of Ethereal Chocolate for your craft and creativity, and to Elana T. at SweetE Organic for carrying this line. 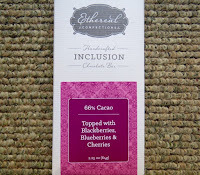 Most of my chocolates have come from retail outlets with carefully curated selections; and it was delightful to be introduced to this bean-to-bar maker (located northwest of Chicago) a few years ago.